Network connect error happen when you try to connect your computer remotely via KVM, in my case I use KVM Avocent DSR 1024. This is actually not KVM problem but Java problem. The easiest way to resolve this problem is by downgrade/upgrade your Java to version 8u45. To check your Java version from control panel – click Java – When Java control panel opened on General tab, click about button and you will see below image. 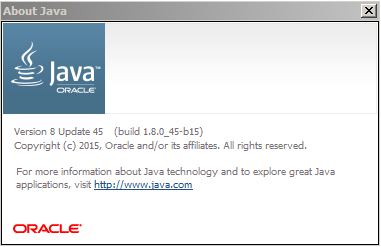 If other than version 8u45 than you have remove that version and install Java version 8u45. Another alternative to check what Java version installed on your PC is by checking Program and features on Control panel, many times you will see several version of java, make sure you only install Java version 8u45.